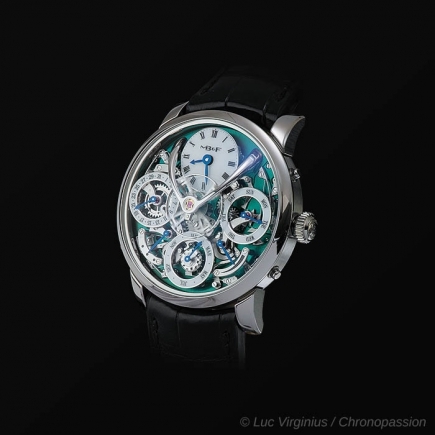 MB&F | 120'000 € Tax inc. 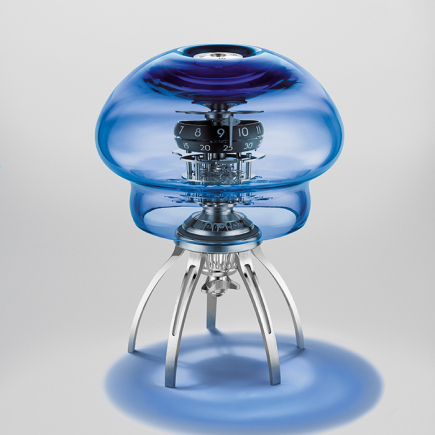 Here comes at last what every MB&F aficionado had been waiting for: the first 100% feminine creation by MB&F. 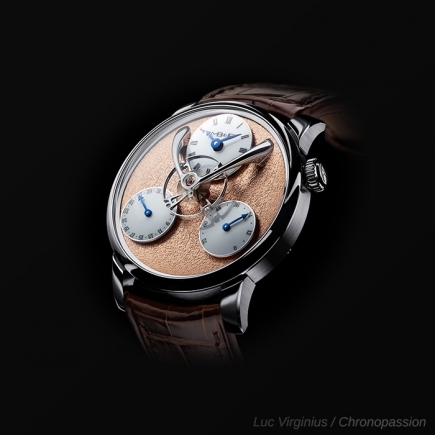 As for all the previous creations by MB&F, we are here again at the crossroads of art and time keeping. The new MB&F FlyingT watch is a limited edition watch imagined by Max Büsser and featuring a flying tourbillon in the middle of the dial. 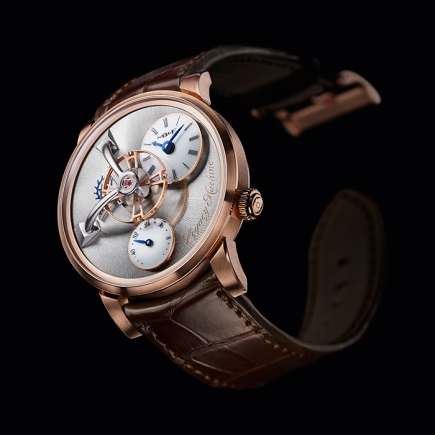 Such a display for the main movement complication (for instance the flying tourbillon), in the centre of the dial, has now become a signature design element for MB&F watches. 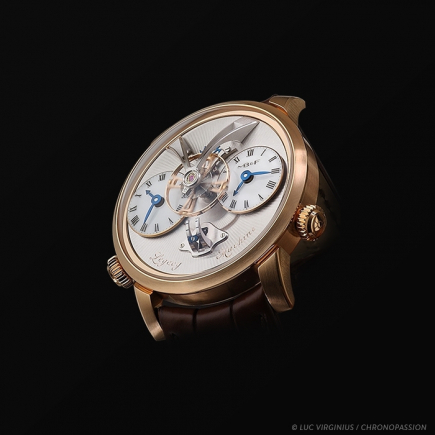 Indeed, how could one not recall the stunning Legacy Machine (LM) watch with its mesmerizing suspended balance wheel in the centre of the dial? 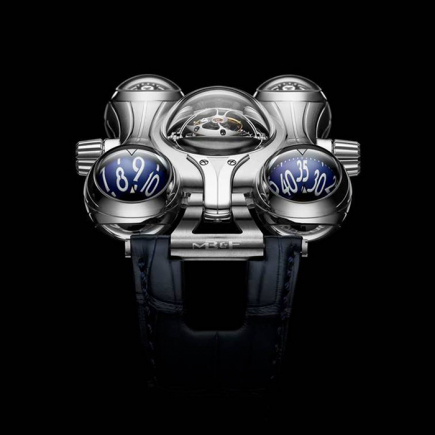 The new MB&F FlyingT watch is a watch that was really imagined from the beginning for women. For Max Büsser, the idea and the inspiration came from the women closest to him: his mother, his wife and his daughter. It is therefore not a watch for men on which a few diamonds have been placed to create a women declination. Apart from the flying tourbillon movement and the tilted dial, the case of the new MB&F FlyingT watch is set with extremely pure, white diamonds. 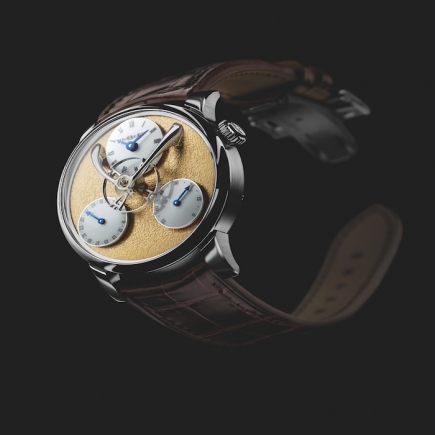 The movement of the new MB&F FlyingT watch is a vertical baguette movement placed in the centre of the dial. 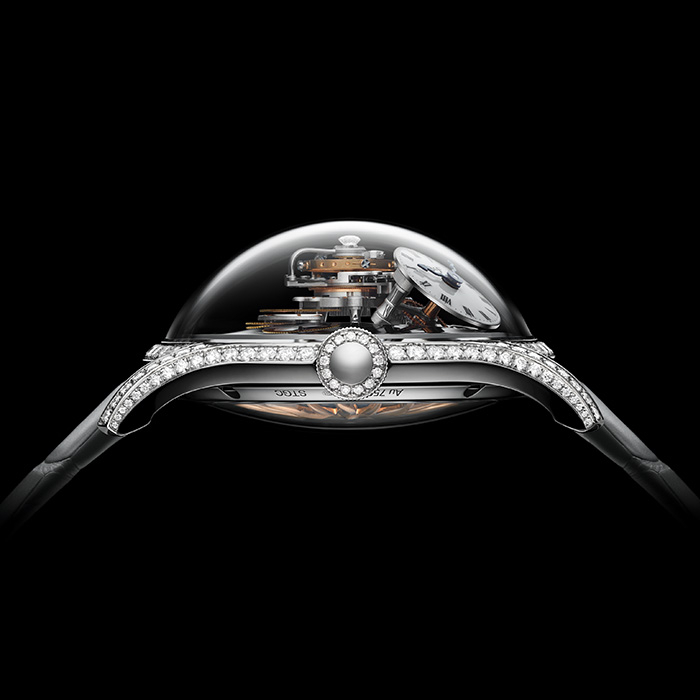 The baguette construction of the movement provides lightness and transparency and enables the wearer (or observer) to dive into the centre of the movement and marvel at its construction. Since the vertical baguette movement of the watch is placed under a typical MB&F domed sapphire glass, this further amplifies the visual effect and offers an even better angle to observe the FlyingT machine and its flying tourbillon movement. The soft, rounded shape of the dome is a nod to tall, elegant women and the vertical baguette movement stands tall right under the pronounced domed sapphire glass. The new MB&F FlyingT watch belongs to the Legacy Machine family and several elements have made the transition from the men machine to the women machine. For instance, the protuberant domed glass and the classic, white hours and minutes counter with Roman numerals and blued hands. The case’s only similarity with the men’s Legacy Machine case is the fact that it is round. The 18K white gold case of the FlyingT watch measures a wearable 38.5 mm and features a steeply cambered bezel and elongated lugs. In all three version of Max Büsser’s FlyingT watch, the case is set with white diamonds. 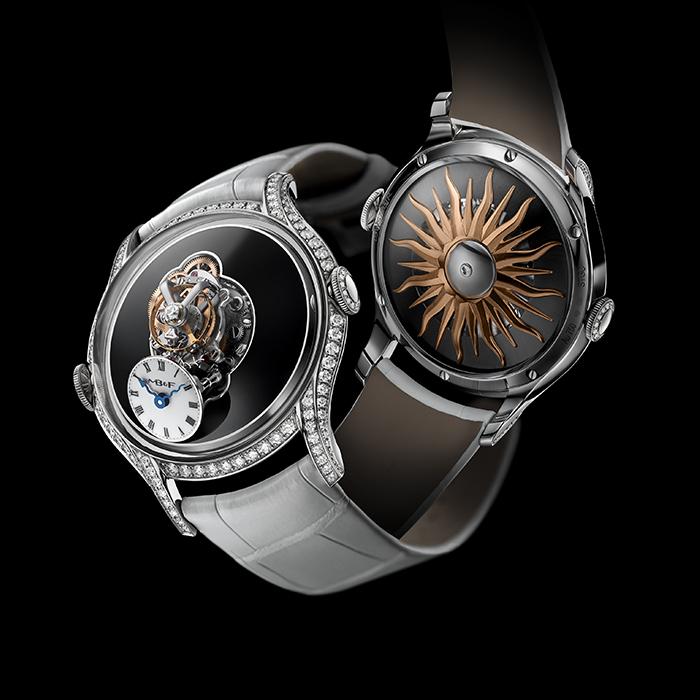 The new white diamond-set MB&F FlyingT watch for women is a watch from the Legacy Machine collection that should be seen as a genuine piece of horological art. The Legacy Machine FlyingT is available in 3 versions: the FlyingT Black lacquer (18K white gold and diamond-set case, with black lacquer dial plate) ; the FlyingT Pavée (18K white gold, case and dial plate fully set with white diamonds) ; the FlyingT Baguette (18K white gold, case and dial plate fully set with white baguette diamonds). Whatever the selected version, the white diamonds delicately set on the 18k white gold case and, for the most fortunate, also on the dial, will provide mesmerizing light reflections of the baguette movement and the flying tourbillon complication. 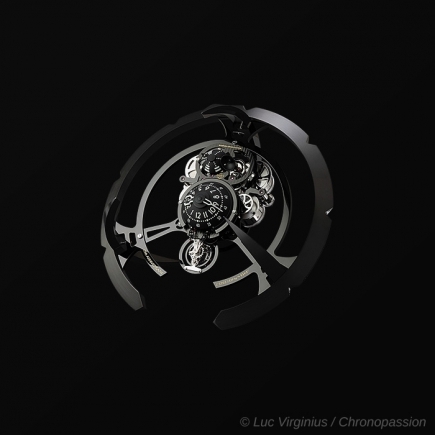 This piece of horological art is unique in its design and in its vertically-stacked movement structure. The 60-second flying tourbillon projects high above the rest of the engine, a kinetic, dynamic column that stops just short of the apex of the sapphire crystal dome. 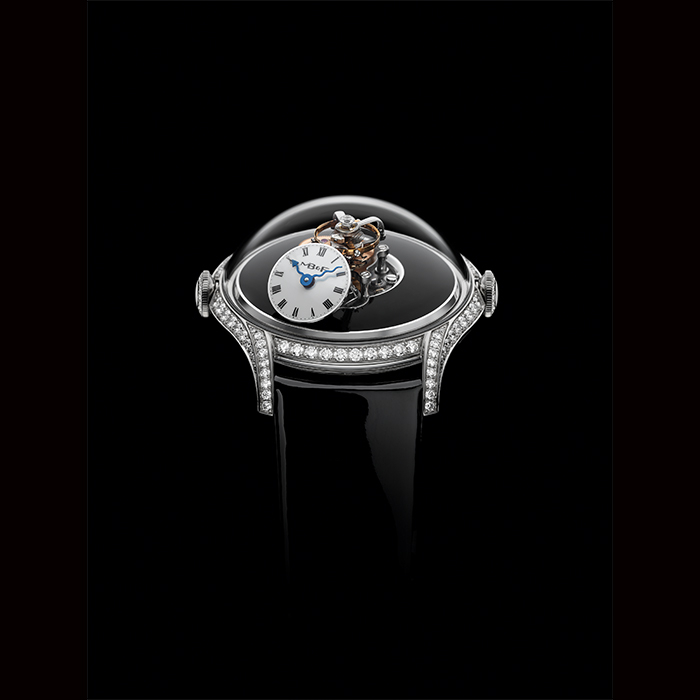 Affixed to the top of the upper tourbillon cage is a single white diamond that rotates simultaneously with the tourbillon. Time is indicated on a small, black or white lacquered sub-dial plate positioned at 7 o’clock. The particularity of this sub-dial plate is that it is tilted 50 degrees to face the wearer. The message is subtle but clear: whoever the owners of the MB&F FlyingT may be, their time belongs to them and no one else. 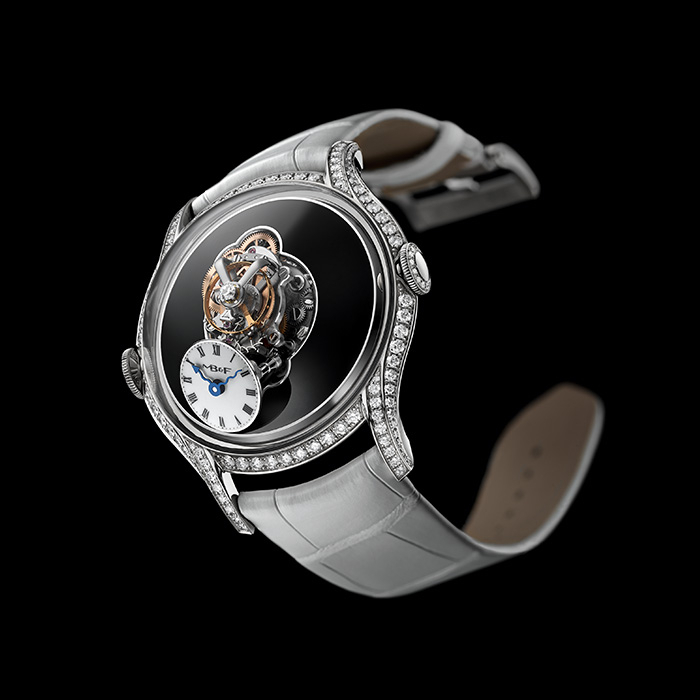 With this new and highly awaited MB&F FlyingT for women, Maximilian Büsser and his friends continue along the path of designing unique horological creations. Max Büsser has always created watches that reflected his own personal dreams, simply doing what he believed in, in an eternal quest for perfection. Yet now had come the time to create a piece of art for others and for instance for women. For Max Büsser, the new Legacy Machine FlyingT had to combine supreme elegance with tremendous vitality. With its flying tourbillon movement, vertical, column-like structure, domed sapphire glass and delicate diamond setting, the MB&F FlyingT watch is definitely alive, full of energy. 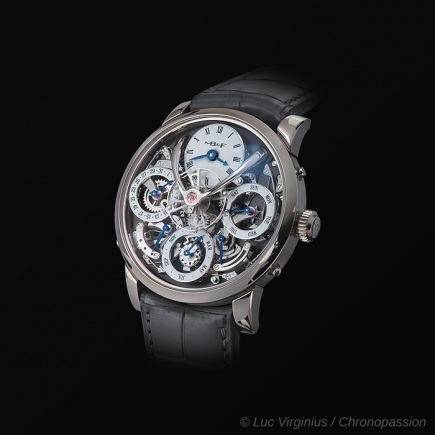 A truly exceptional watch. Three-dimensional sun winding rotor in 18k 5N+ red gold, titanium and platinum. Hours and minutes displayed on a 50° vertically titled dial with two blued serpentine hands. High domed sapphire crystal on top with anti-reflective coating on both sides, sapphire crystal on back. 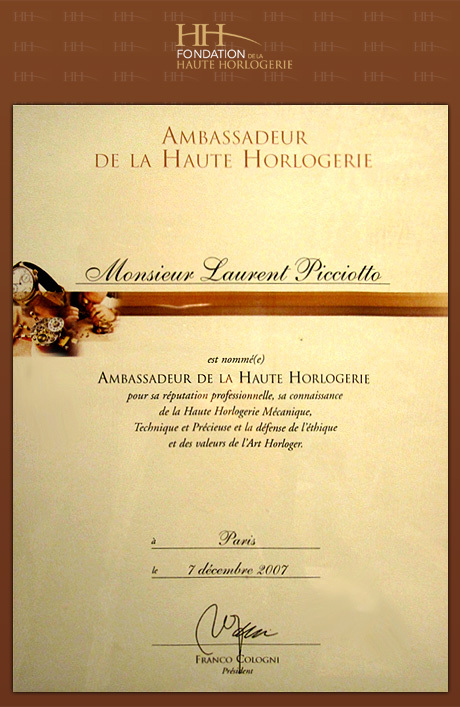 168 stones (120 on the case, 21 on the buckle, 1 on top of the tourbillon cage and 26 for the crowns). About 1.7ct. Calf or alligator leather straps available with 18k white gold pin buckle, set with diamonds.